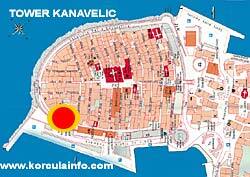 Tower Kanalevic is located on the North-West side of Korcula Town. The tower is also named Bokar or Barbarigo as it is built in period between 1485 and 1488, under rule of Augustino Barbarigo, who was Doge of Venice in period of 1486 to 1501 (hence the name). This tower is nowadays called Kula Kanalevic, the name given after 16th century Korcula poet Petar Kanavelic, who lived in the house next to tower.The tower underwent restauration and repairs in 2006/07.